Thirty years ago a giant lizard foot came thundering down on top of an unsuspecting little deer. Marv Newland's cult classic Bambi Meets Godzilla had been a staple of Spike and Mike's Animation Festival for years and now it is back. And it is not alone. Son of Bambi Meets Godzilla is another animated short that sets the overall tone for the entire festival. Like the work that inspired it, this is a seemingly light piece that has dark undertones played for comic value. The innocent deer in the idyllic woods crushed by a dinosaur is funny because of its incongruous nature (nobody was thinking dinosaur versus deer thirty years ago). The revenge of the technologically savvy deer works just as well - hunters should beware the well-armed deer. That is what this festival is all about. Beautiful images that are carefully crafted by the artists to convey a message perhaps even a moral for these modern fables. These films are designed for adults, although they may seem happy and light-hearted on the surface when you take a second look you see their true selves, mildly subversive and humorously sinister stories. 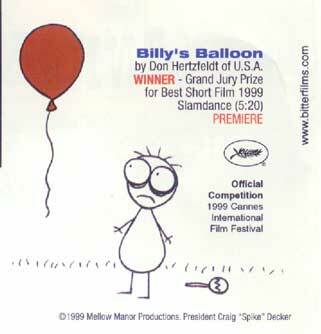 Billy's Balloon - A perverse take on the relationship between a young boy and his balloon. This winner of the 1999 Grand Jury Prize at Slamdance is sure to be a fan favorite for years to come. Reminiscent of Attack of the Killer Tomatoes. 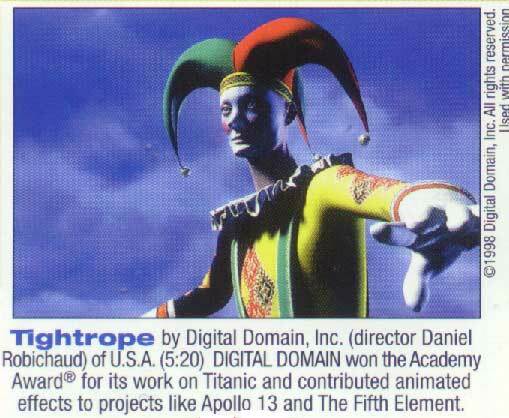 Tightrope - Absolutely stunning work from Digital Domain. The animation is amazing and a wonderfully told story about two opposite numbers, a Jester and a Suit, meeting on a tightrope with no room to pass. Only one can move on safely. Bingo - More fantastic animation, this time from Chris Landreth at Alias Waterfront. A simple day at the circus turns into an exercise of brainwashing for a young clown. And people wonder why clowns are scary? Bingo the Clowno!!! Hum Drum - Funny tale of two shadows passing time and working to prevent boredom. 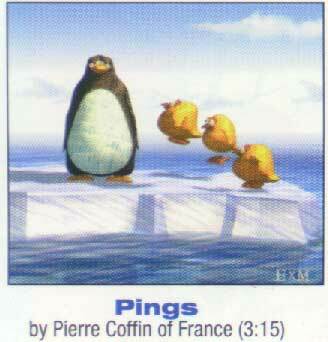 Although it starts slowly, the self deprecating/self referential humor makes this winner of the McLaren Award at the 1998 Edinburgh International Film Festival a welcome addition to Spike and Mike's. The Blue Shoe - Beautifully charming fable, by Peter Reynolds, of looking for and finding love where you least expect it to be. While I did not love every entry into the festival I did feel that each piece had something to contribute that made the show stronger in its entirety. Humor, romance, stunning animation, powerful story telling and thoughtful commentary are all represented by the field shown here. The show did lag a little in the middle with longer and slower pieces such as The Queen's Monastery, Balance and L'Homme Aux Bras Ballants but this in no way robbed the festival of its entertainment value. This is a highly recommended viewing and should not be missed but please take note, this is not the Sick and Twisted Festival and while you will not see Beavis, Butthead or Cartman you will definitely laugh. All work Copyright 2000 by individual artist or Spike&Mike contact Fresh Ink for any reprint information. Copying and/or redistribution is strictly prohibited.